Two feet of snow and more predicted? How to Mix Drinks or The Bon Vivant’s Companion (1862) by Jerry Thomas once again provides a welcome reward for shoveling. This time, I made it up to recipe number 200, Black Stripe. This cocktail combines rum and molasses – two stages of sugar refinement, so they are perfectly matched. The cocktail’s name may come from the two-layer effect when molasses sinks to the bottom of the glass of rum. 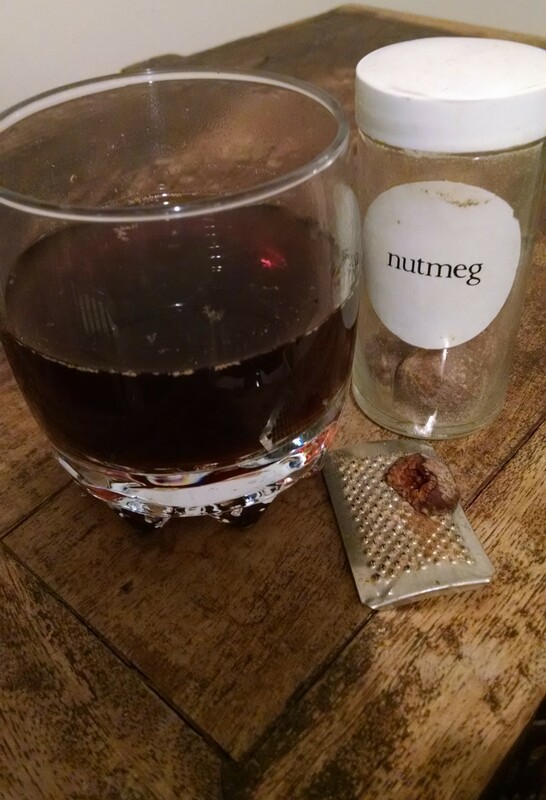 The winter version calls for hot water and nutmeg. In the summer, add a tablespoon of water and fill the glass with shaved ice. I could have conflated the seasons and reached out the door for a spoonful of snow to use as shaved ice, but it was far more satisfying to start the teakettle. Pour the rum and molasses into a tumbler. Fill up the tumbler with boiling water. Grate a little nutmeg on top. This entry was posted in cocktails, cookbooks, Food, history and tagged 1860s, Bon Vivant's Companion, Jerry Thomas, molasses, nutmeg, rum. Bookmark the permalink.